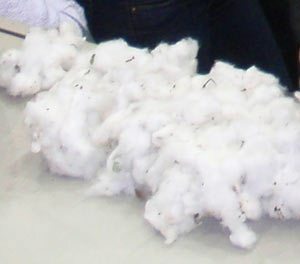 Raw cotton (gin output) contains cotton fiber along with small plant parts and field trash that are not removed by the ginning process. At this stage, the cotton fiber has a coating of oils and waxes that make it hydrophobic. Raw fiber is suitable for making nonwovens to be used in industrial products in which absorbency and aesthetics are not important. In some cases, nonwoven fabrics made with raw fiber can be wet processed in the same manner as woven and knitted fabrics. For nonwovens in which absorbency, whiteness and purity are desired, cotton must be scoured and bleached. Two techniques of commercial scouring and bleaching are kier (vat) and continuous (line) processes. Both processes achieve the same results by the same chemical interactions but with different mechanical handling. Figure 2 is a schematic diagram of the sequential operations involved in virgin cotton bleaching for nonwoven applications. In order to reduce the number of steps and there by using a more environmentally sustainable process, steps 2 (Alkali Scouring Application, 3 (Alkali Reaction Stage), 5 (Bleach Application), and 6 (Bleach Reaction Stage) could be combined using a continuous scouring and bleaching process. In addition, when using mechanically cleaned virgin fiber (virgin fiber that has gone through an additional mechanical cleaning process), Step 4 (Rinsing) could be eliminated, thereby saving water and energy. Figure 3 is a schematic diagram of the sequential operations involved in continuous scour and bleaching of mechanically cleaned virgin cotton. Scouring is accomplished by saturating the cotton fiber with a caustic soda (sodium hydroxide) solution. This alkali solution is allowed to remain on the fiber at elevated temperatures to speed chemical reactions. During this time, the natural oils and waxes are saponified (converted into soaps), the plant matter is softened, and pectins and other noncellulosic materials are suspended, so that they can be washed away. After a predetermined amount of time to allow for complete scouring, the alkali, saponified waxes, and suspended materials are rinsed away with water. At this point, a bleaching solution is applied to the fiber. A stabilized oxidizing agent, hydrogen peroxide or sodium hypochlorite, is used in the bleaching liquor to whiten the fiber by destroying natural coloring matter. In the United States, hydrogen peroxide is most widely used for bleaching raw cotton in fiber form. The bleaching solution is allowed to remain on the fiber at elevated temperatures for a predetermined amount of time to allow for proper removal of the color bodies, then rinsed away. Cotton bleached with hydrogen peroxide contains no dioxins, because neither lignin nor chlorine is present. After scouring and bleaching, all impurities have been removed, and the cotton fiber is in the form of pure cellulose. If the process is done properly, the fiber will meet the requirements for U.S. Pharmacopoeia purified cotton (shown in Table 2 ). Absorbency: sinking time 10 sec. Most of the bleached cotton fiber produced in the United States is processed in large kiers designed to handle several hundred pounds of fiber at once, under high temperature and pressure. Before bleaching, cotton is opened and is generally cleaned to remove non-lint content (trash and dust particles and plant contaminants). The remaining non-lint content should then consist of very small particles that are easily bleached. After bleaching, the wet fiber goes through a moisture extraction operation, and the resulting wet cake is deposited on a spiked apron for opening, followed by drying. The dried fiber then typically passes through some type of opening equipment en route to the bale press. Comber noils < 0.5 in. Second-cut linters < 0.25 in. Bleached cotton finds a wide range of end uses, such as medical and cosmetic swabs and in feminine hygiene products. For such products, unopened fiber clumps and tangles are not so detrimental. However, for bleached cotton going into more critical and demanding items made from lightweight roll goods, such as cover stock and spunlace webs, more uniform fiber openness is essential before web forming, and special opening equipment is required. Proper opening and cleaning is inherently more difficult with kier-bleached cotton than with virgin, raw cotton because of the fiber entanglement that occurs during the wet processing and the high fiber-to-fiber friction caused by removal of the natural waxes and pectins. Although the bleached cotton may be treated with a lubricant and antistatic agents to improve processability, it still requires special opening and cleaning techniques if it is to be acceptable for use in critical nonwoven roll goods. 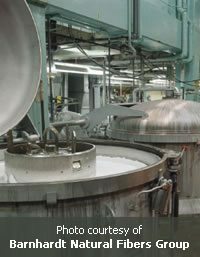 Continued efforts by Cotton Incorporated to improve cotton opening and cleaning led to the development of an advanced fiber opening and cleaning technology. This four-roll opener and cleaner, named the COTTONMASTER®, initially was built by John D. Hollingsworth on Wheels, Inc., using Cotton Incorporated’s design. Presently, Truetzschler GmbH uses similar technology in its Cleanomat Four Roller Cleaner, which is equipped with one fully spiked roll and three saw-tooth rolls of different densities. 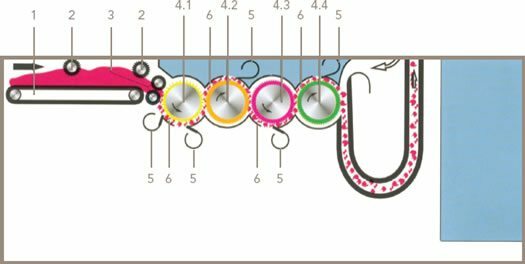 The precise graduation of the clothing density (points per unit area), together with the progressive peripheral speeds of the four rolls, ensures that a high degree of opening and cleaning is maintained as fibers are transferred from roll to roll. The Cleanomat also controls the feed batt density with a batt thickness measuring device, to ensure a consistently even and well-formed batt. The high-performance Cleanomat Four Roller Cleaner (shown in Figure 4 ) is ideally suited for opening and cleaning raw cotton before the bleaching process for any application that requires highly cleaned and well-opened fiber. When considering bleached cotton fiber as a stock material for nonwoven webs, it is essential to select the proper fiber finish. Because bleaching removes the natural finish, bleached cotton has high fiber-to-fiber friction. A lubricant and antistatic agent must be added to the fiber to allow it to be processed through the high-production web-forming equipment commonly used for nonwovens. Over the years, such finishes as soap, glycerin and Tween (ethoxylated sorbitan esters) products have been used, with limited success. Cotton Incorporated discovered the value of butoxyethyl stearate (BES), which is now the fiber finish of choice. This chemical finish provides satisfactory lubricity without interfering with absorbency, and it has good acceptability from a toxicity standpoint, which is a more important concern than improved physical properties. A recommended fiber finish system for most bleached cotton includes BES and sodium acetate at add-on levels of 1.0% on weight of fiber (OWF) each. Addition of the salt provides antistatic benefits during mechanical processing, as shown by the trial results given in Table 4. Cotton Incorporated has performed extensive fiber finish evaluations on various bleaching practices and has found the most useful test, with the exception of carding, to be a sled test from Imperial Chemical Industries PLC.1 The apparatus used in this test is shown in Figure 4. To prepare the fiber sample for testing, 450 grams of fiber were carded through a Shirley card, and the web was collected by layering on a turning cylinder. To ensure sample uniformity, the web was removed from the cylinder and carded a second time. The card web was pulled apart and removed from the cylinder. Test specimens were cut four inches square from a single web thickness, and individual specimens were placed on the apparatus for testing. The sled was placed on the fiber sample, and a 2-kg weight was placed on the sled. The sled was connected to the load cell with a small-diameter flexible cable. The rate of pull by the tensile tester was 25 mm/min, and the force was recorded on a chart. When the chart reached a steady level, the friction force value was recorded in grams. The method is based on ANSI/ASTM D 1894-78, Standard Test Method for Static and Kinetic Coefficients of Friction of Plastic Film and Sheeting.